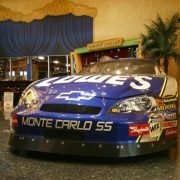 Jimmie Johnson’s Number 48 Nascar Racer is on loan to the Cars of Dreams museum to help as an attraction for fundraisers. (In the future it will be replaced with Jimmie’s Number 24 car). 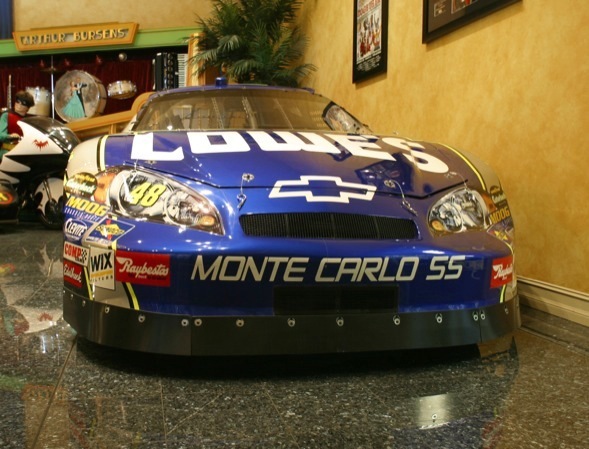 Three time NASCAR Sprint cup champion Jimmie Johnson drove this #48 Lowe’s Chevrolet (Chassis #48-297) nine times during the 2004 and 2005 seasons, as well as the 2006 cup championship season. 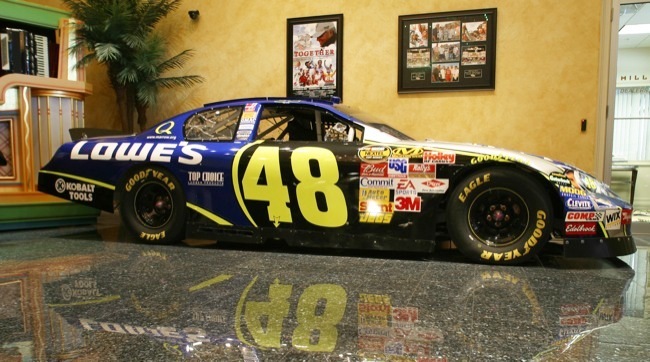 This car visited victory lane three times, including the sweep of both Pocono races in 2004, and the UAW-Daimler-Chrysler 400 at the Las Vegas Motor Speedway in March 2005. 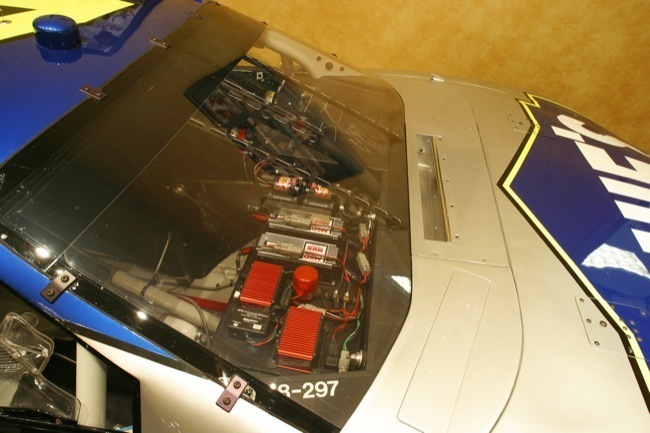 In addition to the wins, this car has two top fives and one Top 10 finish, contributing to an eighth place average finish during its days of competition. 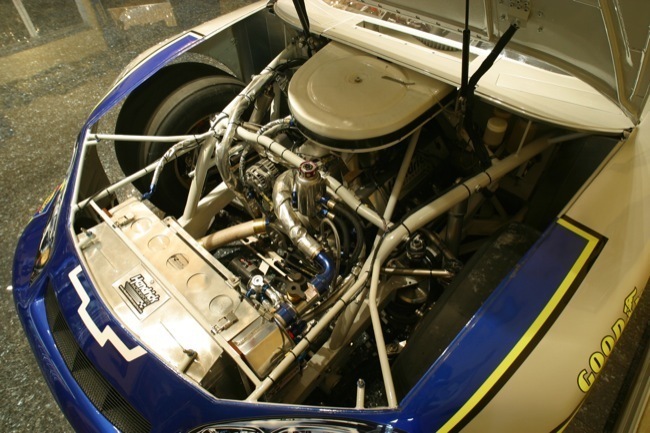 Car #48-297 comes built complete by the Hendrick Motorsports #48 race shop and includes an authentic Hendrick race engine rebuilt with the certified SB2, 358 C.I. 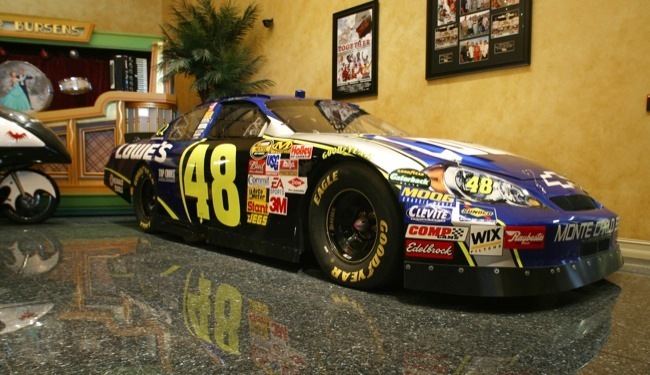 block raced by Jimmie Johnson to win the August ’04 race at Pocono Raceway. 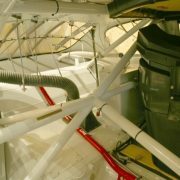 The car comes with certificates of authenticity, extensive documentation, and a collection of race day photographs. Jimmie Johnson is only the second driver in NASCAR history to win three consecutive Cup series championships. 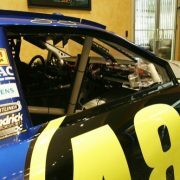 Jimmie Johnson made professional sports history in 2009 by earning his fourth consecutive NASCAR Sprint Cup Series title. He is the only driver in the sport’s 61-year history to accomplish the feat. His amazing accomplishment this year also earned him several awards. He became the first race car driver to be named the Associated Press’s Male Athlete of the Year in the organization’s 78-year history and was voted Driver of the Year for the third time in his career, joining Mario Andretti, Darrell Waltrip and Jeff Gordon as three-time winners of the prestigious award. After only eight full seasons and 291 starts, Johnson has rewritten the sport’s record books. The El Cajon, Calif.-native led the point standings the final seven races of the Chase for the NASCAR Sprint Cup in 2009, finishing the season 141 points ahead of second-place finisher and teammate Mark Martin. It was Johnson’s eighth-consecutive top-five finish in the point standings. 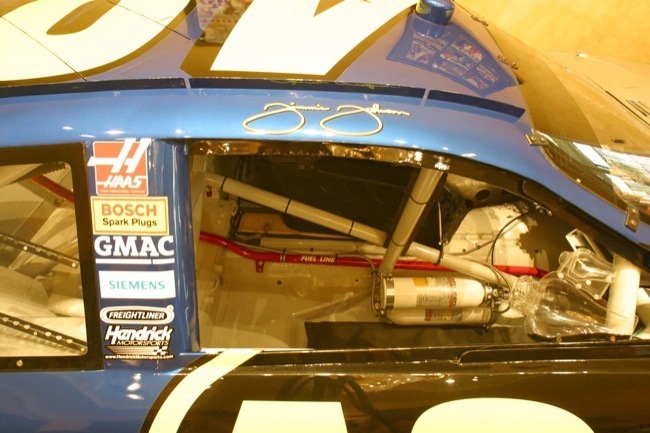 Since Johnson made his full-time Cup Series debut in 2002 (ran three races in ’01), his 47 career wins are 22 more than any other competitor during that time and place him second among active drivers on NASCAR’s all-time wins list. 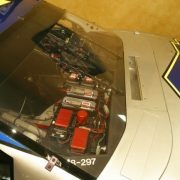 He has also earned 18 “Chase” wins since its inception in 2004, 12 more than his closest competitor. Entering the 2010 season, Johnson is the only driver to win at least three races in each of his first eight Sprint Cup Series seasons. 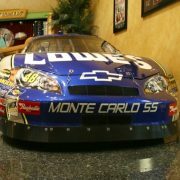 He had seven wins and four poles in 2009 and is the only driver to qualify for the Chase for the Cup each year since the format was adopted. The 34-year-old Californian clinched his first championship in 2006 finishing 56 points ahead of second-place finisher Matt Kenseth. 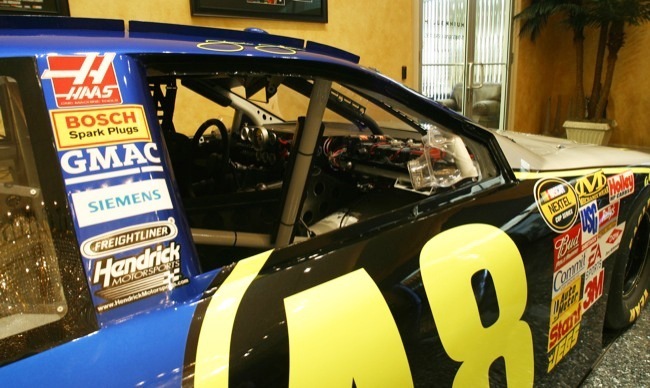 He followed that up in dramatic fashion with a 77-point win over teammate Jeff Gordon in 2007. 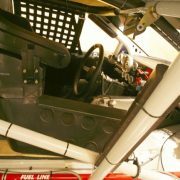 His third championship came in 2008 when he edged out Carl Edwards by 69 points. But Johnson’s impact isn’t limited to the race track. 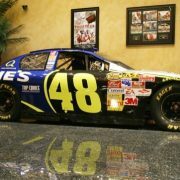 Johnson and his wife, Chandra, launched the Jimmie Johnson Foundation in 2006. The foundation is dedicated to helping children, families and communities in need. 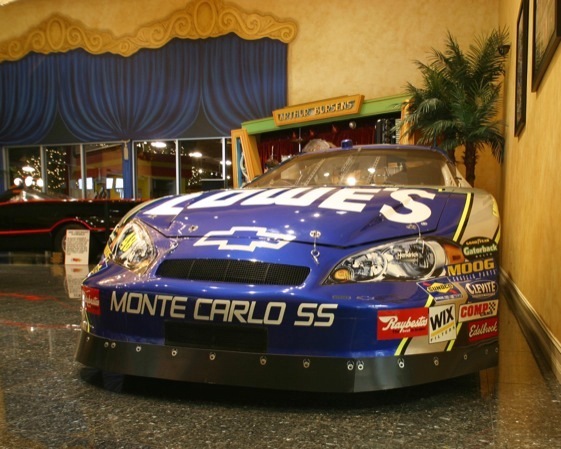 In March of 2007, the couple opened Jimmie Johnson’s Victory Lanes, a four lane bowling center for campers at Pattie and Kyle Petty’s Victory Junction Camp in Randleman, N.C. 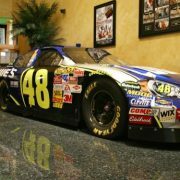 In addition to supporting organizations such as the Hendrick Marrow Program and the Make-A-Wish Foundation, the Johnsons host the Jimmie Johnson Foundation Golf Tournament in San Diego each year. Since its inception, the tournament has raised more than $2 million for Johnson’s hometown, helping fund projects such as the construction of four Habitat for Humanity homes. 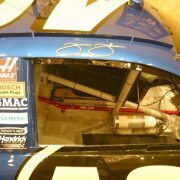 In 2009, nearly $1 million was awarded through the Jimmie Johnson Foundation/Lowe’s Toolbox for Education Champions Grant program. Public schools in California, Oklahoma and North Carolina, where the Johnsons grew up and currently reside, received grants to address basic needs including science and technology, outdoor classrooms, playground construction and accelerated reading programs. While Johnson’s success on and off the track has come in a relatively short amount of time, it took years of hard work, dedication and help from a variety of people to get there. With the support of his family, Johnson’s racing career started on 50cc motorcycles at the age of five. His father, Gary, worked for a tire company and his mother, Cathy, drove a school bus. With Jimmie and younger brothers Jarit and Jessie in tow, the family spent most of their weekends camping and doing what they loved – racing. During these weekends, it wasn’t unusual to see Gary preparing the tracks for the kids to race and Cathy running the concession stand. Johnson was successful on motorcycles at an early age. By the time he was eight, he won the 60cc class championship despite blowing out his knee with several races remaining in the season. From motorcycles, Johnson graduated to the Mickey Thompson Entertainment Group (MTEG) Stadium Racing Series where he won more awards. A 1993 meeting arranged by his mentor, supercross champion Rick Johnson (no relation), proved fortuitous for the eager driver. While racing at the Los Angeles Coliseum, Rick Johnson introduced his young protégé to the Executive Director of GM Racing, Herb Fishel. The protégé lived up to his billing, impressing Fishel with his driving ability and business acumen. Fishel kept his eye on Johnson that year. He later walked into an off-road racing team meeting and threw a picture of Johnson on the table informing the team that Johnson was the man they needed to drive their car. 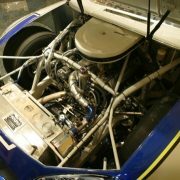 Johnson seized the opportunity, spending the next few years driving buggies and trucks in off-road stadium and desert races. Johnson also improved his ability to connect with fans and potential sponsors by reporting for ESPN in the Short Course Off-Road Drivers Association Series (SODA). 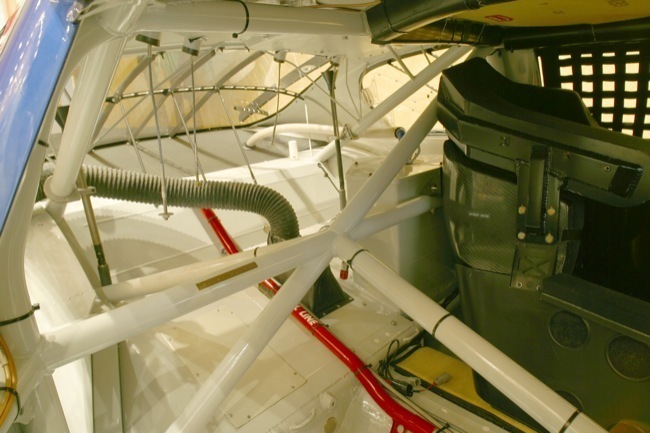 In 1995, the work paid off in another way as Johnson met his future car owners Stan and Randy Herzog while working in the series. The following year Johnson began driving the brothers’ off-road truck. After two years, Johnson was ready for the next opportunity and crafted a proposal, taking it to his friend, Fishel. 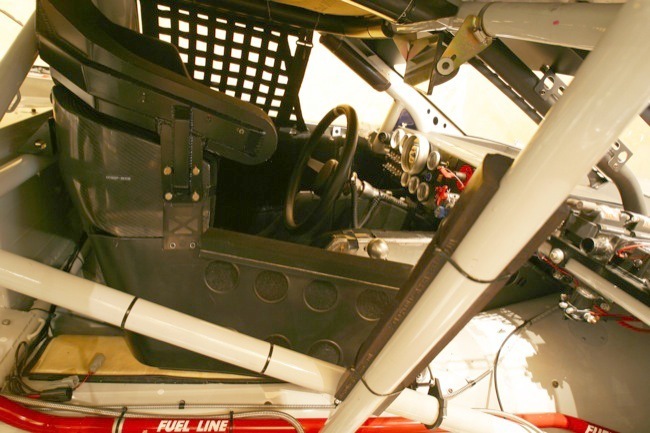 Fishel gave the owners and their ambitious driver a shot and in 1998 Johnson climbed behind the wheel of an American Speed Association car and got his first taste of pavement racing and never looked back. His victories in the ASA Series paved the way for his move to NASCAR (initially in the Nationwide Series) where his winning ways continue as the current NASCAR Sprint Cup Champion.